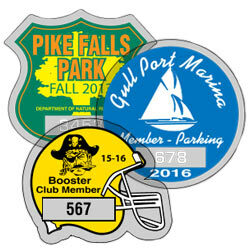 Looking for a custom shaped parking decal? Do you want decals to match your business or event? Die-cut parking decals are exactly what you need! 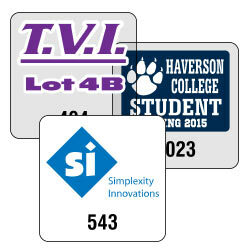 Available with consecutive numbering, these custom decals will keep your parking validated and look good doing it. 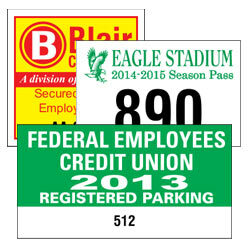 Die-cut parking permits are unique and easy to use. Every die-cut permit is kiss-cut and supplied on a backing sheet since they have face adhesive. 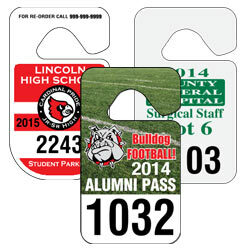 Our die-cut permits are provided on clear polyester or clear static stick material, and meant for indoor use only. 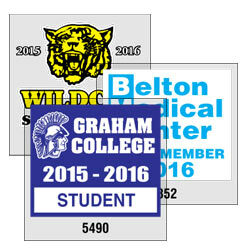 For your imprint you can choose from any of our standard colors. White is included in the base price. Consecutive numbers are 7/32" high and printed black only. Numbering is included in price. Production Time: Approximately 7 working days (10 working days if consecutively numbered). 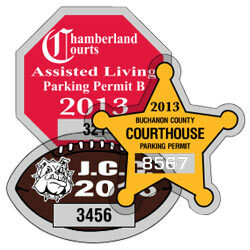 Die-Cut Parking Permits: See page 46 for die-cut designs. See chart below for pricing. Numbering: 7/32" consecutive numbering is available. Please specify beginning and ending number when ordering.